Put the chopped tomatoes into a small pan with the wine and garlic. Bring to a simmer and cook for 20 minutes or until they become soft and pulpy. Sieve the tomato sauce and season. Meanwhile place the peppers under a grill and cook, turning until blistered and blackened all over. Put into a plastic bag and leave to cool. Cut each pepper into quarters lengthways removing the seeds. Season the ricotta cheese with salt and pepper and mix in the basil. Take a heaped teaspoon of the mixture and place at the narrow end of each pepper, place a scant teaspoon of chopped tomato on top. Roll up and place in an ovenproof dish. Spray each pepper 3 times with Fry Light, then put the dish into the oven to heat through for 10 minutes. 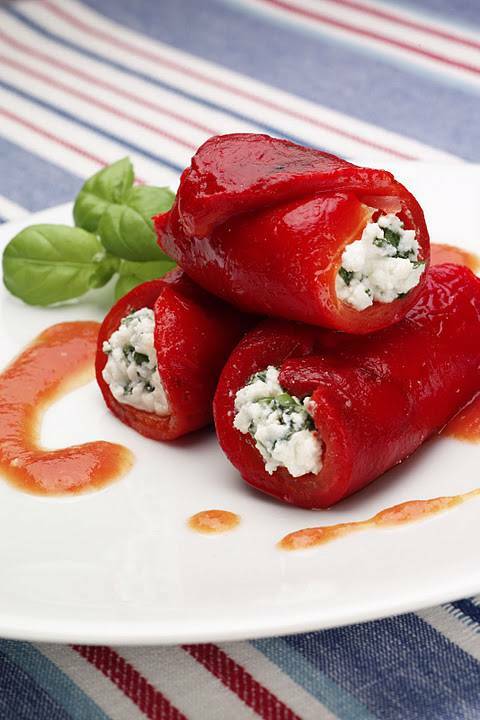 While the peppers are in the oven, gently re-heat the tomato sauce before serving with the stuffed peppers. Serve with extra basil leaves to garnish. "Creative Mondays Week 1 : Blackberries Smoothie…." "Linwoods Beauty Boosting Strawberry Smoothie…"